The predecessor of our organisation was a foundation called Minority Rights Group –Slovakia(MRG – S), established in 1992 by the Minority Rights Group International (MRGI), a London-based international non-governmental organisation concentrating on the implementation of a minority rights prevention strategy. During our existence as MRG-S we established cooperation links with renowned European and international organisations and institutions, including the European Community, the Council of Europe, OSCE, etc. We were engaged in the promotion of their activities, ideas, plans and initiatives, and contributed to their implementation. The activities we performed within the Minority Rights Group -Slovakialater extended farther beyond the original scope which was the protection of minority rights. 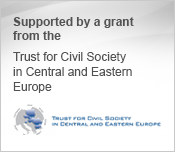 Therefore, we adopted a new name in the summer of 1997 – the Citizen and Democracy Foundation, Minority Rights Group -Slovakia. We extended our activities to include those contributing to the strengthening of public participation in a democratic society and, the promotion and exercise of fundamental human rights in the everyday lives of Slovak citizens. We also launched advocacy activities and started providing legal assistance. In keeping with our new mission and objectives we actively participated in a number of non-governmental sector’s campaigns that helped us win popularity with the Slovak public (OK’98; Initiative for a Good Law on Access to Information; For the School Reform, etc.). In a response to legislative changes, we changed our legal form from a foundation to a civic association called Citizen and Democracy and the end of 2002. With the growing number of activities performed, the extent and scope of our mission increased as well. Taking into consideration the developments in Slovak society we therefore decided to update our priorities and rename our organisation. We changed our name to Citizen, Democracy and Accountability as of 7th January 2010 (in Slovak: Občan, demokracia a zodpovednosť). The key element of our current activities is to consistently hold public authorities accountable for the lacking systematic enforcement of human rights. Therefore, we primarily focus on the realisation of a right to human dignity for all, protection against discrimination, and women’s human rights. We work towards positive changes in society at all levels – from individuals up to systematic changes in public governance. Direct involvement in law-making and public policy-making is a substantial component of our activities. We also provide comprehensive accredited training courses to the public and private sector, on (anti)discrimination and gender equality in particular. We continue in our efforts to provide information to people about their rights, to develop their social and legal skills, as well as to encourage them to actively exercise their rights and participate in public affairs. In addition, we strive to contribute to providing space for a dialogue between public authorities and civil society.